You might not want anyone to read the work you put together as a university student—I sure don’t. But we’re not Stephen Hawking, world-famous physicist, whose Ph.D thesis you can now read for free online. People seem to like this Stephen Hawking guy. His book, A Brief History of Time, has sold ten million copies. He’s made pop culture appearances far and wide, from The Big Bang Theory to The Simpsons. He’s the subject of the Oscar-winning film, The Theory of Everything. But he’s known in science for exploring more esoteric topics in physics. Perhaps his most famous idea is “Hawking radiation,” the theory that links the mathematics of gravity with quantum physics to conclude that black holes evaporate by spitting out particles from their surface. The thesis discusses some of the most talked-about points in physics, specifically the “implications and consequences of the expansion of the universe.” Such expansion causes difficulties to one theory of gravitation and has implications for how gravity radiates through the universe, moving its energy along as waves. It also describes the inevitability of singularities, regions of infinite density and zero volume found in the centers of black holes or the start of the universe. These ideas continue to spark debate. 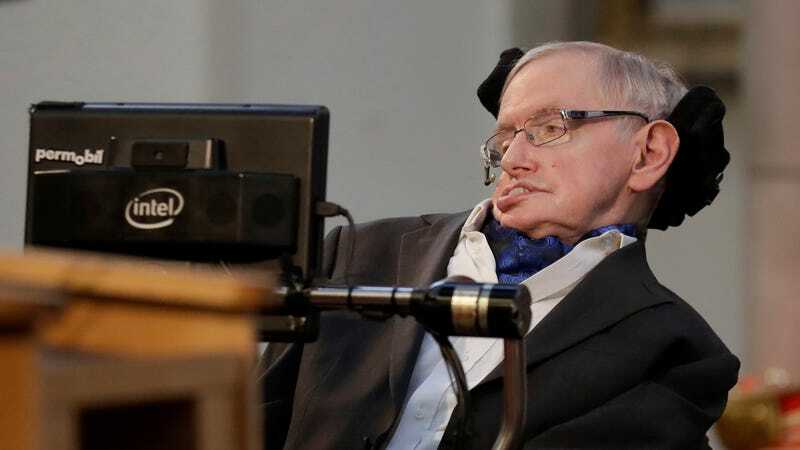 Meanwhile, Hawking himself, at 75 years old, is still a living public figure despite his 50-year-log struggle with amyotrophic lateral sclerosis (“Lou Gehrig’s Disease” or ALS), a disease whose victims rarely survive a decade. The news release comes alongside increasing interest in the Open Access movement, allowing us to access published science papers for free. Open Access hasn’t been without controversy as shady scientific journals have attempted to game the system to make a quick buck. Cambridge encourages its students to make their Ph.Ds open access when they deposit it online, according to the release. So, if you’ve got some free time, enjoy the light reading of a preeminent physicist’s 120-page Ph.D thesis. Update 12:ooPM: The BBC reports that Cambridge’s download website has been crashing intermittently due to the heavy traffic, lol. At least 30,000 have tried to download the PDF. Honestly, I preferred Hawking’s later stuff.